Zika virus spreading explosively: Pending pandemic? Zika virus (ZIKAV) is a flavivirus that was first isolated from a Rhesus monkey in the Zika forest in Uganda in 1947. Since its discovery, ZIKAV has been occasionally associated with disease in Africa and Asia. Prior to 2015, ZIKAV outbreaks occurred in Africa, Southeast Asia, and the Pacific Islands. In May 2015, the Pan American Health Organization issued an alert of the first confirmed ZIKAV infections in Brazil. Since this time, an estimated 1.3 million cases have been reported, bringing epidemic status to the explosive spread. The outbreak in the Americas and the South Pacific is evolving rapidly and ZIKAV will continue to spread. Although it is difficult to predict the patterns of spread, Bogoch et al. created a Zika virus spread model based on a seasonal model for Dengue that integrated both worldwide ecological niche data for Aedes aegypti and A. albopictu and temperature profiles . This data was mapped onto common international travel routes across North, South, and Central America. 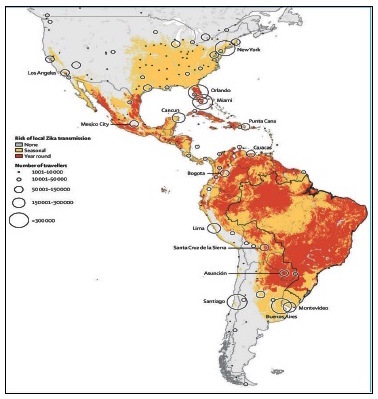 Notably, the models suggested that the risk of seasonal Zika transmission is possible throughout Latin American and the Caribbean, and in parts of the United States (South and West) (Fig. 1). Additionally, year round transmission of the virus was also predicted to be possible throughout these same regions, with the United States showing less risk except in Florida. Importantly, no locally transmitted cases have been reported to date in the continental US, but cases have been reported in returning travelers. However, the first locally transmitted infection was reported in Puerto Rico in December 2015. Fig. 1. Map depicting the potential spread of Zika virus across South, Central, and North America . Unlike most arboviruses that replicate in the cytoplasm of the host cells, ZIKAV replicates in the nucleus. ZIKAV is an enveloped virus with a positive sense, single stranded, 11 kb RNA genome. It contains 5’ and 3’ untranslated regions flanking a single open reading frame. The single polypeptide is cleaved by cellular and viral proteases into three structural proteins, the binding capsid, and seven non-structural proteins. Infection begins in dendritic cells at the site of inoculation, and spreads to lymph nodes and the bloodstream throughout the host. At present, ZIKAV viral RNA concentrations are detectable in blood specimens collected <3 days after the onset of illness, and levels are still detectable in some individuals as late as 11 days after illness onset . ZIKAV manifests clinically with headache, rash, fever, joint pain, and malaise; the symptomology resembles that of Dengue, Yellow Fever, West Nile, and Chikungunya viruses. However, it is estimated that only 1 in 4 infected individuals will develop symptoms. During the French Polynesian outbreak in 2013-2014, 74 cases of Guillain-Barre Syndrome (GBS) or other autoimmune syndromes associated with 8,750 suspected ZIKAV infections were reported (11-14 from rapid risk assessment). In one case report from 2013, a patient was described who developed GBS 7 days after ZIKAV infection . The patient developed ascending symmetrical muscular weakness followed by tetraparaesthesis predominant in the lower limbs, with paraesthesis of the extremities, diffuse myalgia, and a bilateral asymmetrical facial palsy. Forty days after onset, the patient was able to walk unassisted with satisfactory muscular strength score. One-hundred and twenty one cases of GBS associated with suspected ZIKAV infections were reported in Brazil and investigations are ongoing into causation. According to the World Health Organization, within the past year, a total of eight countries and territories have reported an increased incidence in GBS and/or laboratory confirmation of a Zika virus infection among GBS cases. Most recently, a case-control study conducted in French Polynesia provided initial statistical evidence of a link between Zika virus infection and GBS. Of the 42 patients diagnosed with GBS during the observational period, 98% of patients with GBS had anti-Zika virus immunoglobulin M (IgM) or immunoglobulin G (IgG) and 100% had neutralizing antibodies against Zika virus . However, in the largest control group (N=98), only 36% had anti-Zika virus IgM or IgG and 56% with neutralizing antibodies. Possible causal links between ZIKAV infection during pregnancy and fetal microcephaly are under investigation . Investigations began shortly after the Brazilian Ministry of Health noted an unusual increase in the numbers of microcephaly in the Northern states of Brazil. In November of 2015, the Brazilian Heath Ministry declared a public health emergency as the number of cases of microcephaly had increased 20-fold. Between 2001 and 2014, approximately 163 cases of microcephaly were reported annually in Brazil. As of February 2016, 5909 cases had been identified in Brazil that coincided with suspected ZIKAV infection of the mothers . Of the 5909 cases reported, 641 cases were confirmed due to ZIKAV and 4222 cases remain under investigation. Additionally, 139 child deaths have been reported due to the virus, which includes both deaths during (e.g., miscarriage, stillbirth) or after pregnancy. Diagnostic tests (e.g., ELISA or real-time PCR on acute-phase serum samples detecting viral RNA) are available for ZIKAV but they are less than optimal. For example, the ELISA test (developed in the Arboviral Diagnostics and Reference Laboratory at the Centers for Disease Control and Prevention) detects IgM to ZIKAV. However, the test is cross-reactive because of the close relationship between ZIKAV and other flaviviruses such as dengue or yellow fever virus. According to Duffy et al. , ZIKAV is less likely to cross-react with alphaviruses such as chikungynya or Ross River viruses. Furthermore, cross-reactivity is also observed among patients who have been previously exposed or vaccinated against other flavivirus infections . As noted by Hayes , the general guideline for diagnostic testing for flavivirus infections should include both an acute-phase serum sample (close to illness onset as possible) and then a second sample collected and examined 2-3 weeks after the initial sample . At present, there are no Zika virus vaccines in the advanced stage of development. Therefore, the best we can do at present is to engage in national preparedness measures. We can increase preparedness by increasing surveillance of Zika virus, engaging in risk communication (e.g., health campaigns, travel advisories), and engaging in vector control measures (e.g., house screens, insecticide spraying, removal of household debris and containers that are breeding grounds for mosquitos) [6, 9]. Engaging in prevention measures, particularly vector control methods, will be most difficult for disadvantaged individuals and families living in crowded metropolitan regions. Unfortunately, these are the regions most susceptible to the spread of the virus. Bogoch, II, Brady OJ, Kraemer MU, German M, Creatore MI, Kulkarni MA, Brownstein JS, Mekaru SR, Hay SI, Groot E et al: Anticipating the international spread of Zika virus from Brazil. Lancet 2016, 387(10016):335-6. Lanciotti RS, Kosoy OL, Laven JJ, Velez JO, Lambert AJ, Johnson AJ, Stanfield SM, Duffy MR: Genetic and serologic properties of Zika virus associated with an epidemic, Yap State, Micronesia, 2007. Emerging Infectious Diseases 2008, 14(8):1232-1239. Oehler E, Watrin L, Larre P, Leparc-Goffart I, Lastere S, Valour F, Baudouin L, Mallet H, Musso D, Ghawche F: Zika virus infection complicated by Guillain-Barre syndrome–case report, French Polynesia, December 2013. Euro Surveillance : Bulletin Europeen sur les Maladies Transmissibles = European Communicable Disease Bulletin 2014, 19(9). Cao-Lormeau VM, Blake A, Mons S, Lastere S, Roche C, Vanhomwegen J, Dub T, Baudouin L, Teissier A, Larre P et al: Guillain-Barre Syndrome outbreak associated with Zika virus infection in French Polynesia: a case-control study. Lancet 2016, Published Online February 29, 2016, http://dx.doi.org/10.1016/S0140-6736(16)00562-6. Ventura CV, Maia M, Bravo-Filho V, Gois AL, Belfort R, Jr.: Zika virus in Brazil and macular atrophy in a child with microcephaly. Lancet 2016, 387(10015):228. Lucey DR, Gostin LO: The Emerging Zika Pandemic: Enhancing Preparedness. JAMA 2016, 315(9):865-6. Duffy MR, Chen TH, Hancock WT, Powers AM, Kool JL, Lanciotti RS, Pretrick M, Marfel M, Holzbauer S, Dubray C et al: Zika virus outbreak on Yap Island, Federated States of Micronesia. The New England Journal of Medicine 2009, 360(24):2536-2543. Hayes EB: Zika virus outside Africa. Emerging Infectious Diseases 2009, 15(9):1347-1350. Fauci AS, Morens DM: Zika Virus in the Americas – Yet Another Arbovirus Threat. The New England Journal of Medicine 2016, 374(7):601-4.